Three million individuals each year will suffer some type of personal injury. The compensation can be placed into a special type of trust and protected from being taken into account by the authorities when determining present and future means tested benefits. trustees should ensure that the trust assets are not used for everyday living expenses. 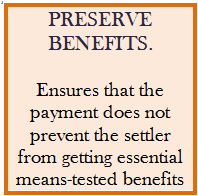 Even if the individual does not get means tested benefits right now they may wish to protect the compensation from the growing cost of long term care. This is a big concern for many individuals and can be avoided by using Personal Injury Trusts. Normal expenses of daily living are supposed to be met by means-tested benefits. These include gas, water, electricity, food, mortgage interest, council tax, rents and payments for residential care. These should, as far as possible, continue to be met by means tested benefits. If there is a shortfall to these bills then can be met from the trust along with other expenditure such as buying a car or paying for a holiday. 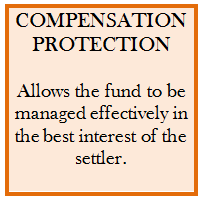 The compensation is invested to protect the assets and to make the most of the compensation. 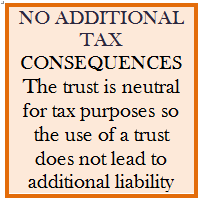 £5,000 can be withdrawn from the trust each year without giving rise to a tax liability.